Students at International Technology Academy in Pontiac, Michigan give President Bacow and HGSE Dean Long a tour of the Robotics Lab. 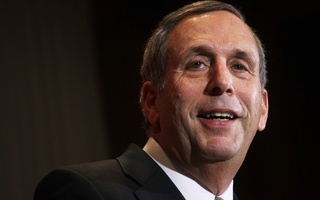 University President Lawrence S. Bacow returned to his home state of Michigan last week to tell residents: Harvard isn't so bad. Bacow stopped through Detroit and Pontiac to make the case to locals that the University can positively impact their lives and neighborhoods. The trip, which came two months into Bacow’s fledgling presidency, falls at a moment when colleges and universities are facing a hostile political climate around the nation. 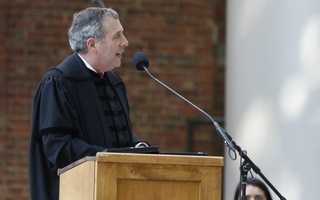 When Bacow was appointed in February, he pledged to reach out to all parts of the country and address criticisms — some of which he called “fair” at the time — that Harvard caters to coastal elites. Accompanied by Bridget Terry Long, the new dean of Harvard’s Graduate School of Education, Bacow spoke to a group of high school students Thursday in Pontiac, Mich. He urged them to set ambitious goals and persevere in the face of adversity. Bacow called the experience “moving” not just for him, but also for the students, who were nearly all black or Latinx. Bacow added Pontiac is the poorest city in the state of Michigan and that, for that reason, he felt it was “important” students hear his message from someone who grew up there. Bacow’s trip extended through Friday, when he traveled to Michigan’s largest city to speak at an event called “Detroit Homecoming.” Detroit “expats” congregated at the homcoming to reconnect with their hometown and to speak about issues facing the city and the rest of the state. Bacow participated in a panel alongside M. Roy Wilson, the president of Wayne State University — a large public research university located in Detroit. 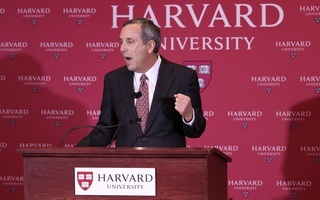 Bacow cited Wilson, who graduated from Harvard Medical School, as an example of a Harvard alumnus who is doing important work in parts of the country outside of New England. 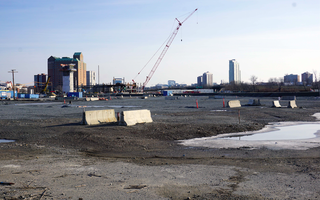 “I think it’s important that people understand that graduates of Harvard are working hard to make places like Detroit more vibrant, more interesting, and to create opportunity for others,” Bacow said. He sought to debunk what he called a common belief that Harvard only helps those in its immediate radius. “There’s a perception at least in parts of the country that only people who attend Harvard or only people who live nearby places like Harvard benefit from what we do,” he said. Harvard sought to demonstrate a broad national reach during the decade-long tenure of former University President Drew G. Faust, too — especially in the months following the 2016 election, which left top Harvard administrators feeling concerned about the future of the University and higher education in America. Bacow’s visit to Michigan follows several similar trips Faust made during the waning months of her presidency to high schools in Philadelphia, Penn. and Cincinnati, Ohio, among other cities. Bacow plans to continue this practice. He said Friday he hopes to visit more schools in the “heartland” of the country. Public opinion regarding higher education has soured in recent years — a decline some would say culminated in Republican lawmakers' successful passage of a law last December that levied an “unprecedented” tax on some universities’ endowments. The tax would have cost Harvard an estimated $43 million in 2017. Faust lobbied extensively against the tax, and Bacow will likely follow in her footsteps. Under Bacow, Harvard is also expanding its collaborations with universities beyond the Ivy League. Harvard and the University of Michigan recently announced a partnership in which the two schools will study issues of economic mobility and opioid addiction in Detroit and across the country. “What I’ve tried to do on this trip is to connect with people in Detroit and Pontiac... and to help identify ways in which not just Harvard but universities around the country can work to try and address issues of income inequality, social mobility, opioid addiction, and other major issues which exist throughout the country,” Bacow said.